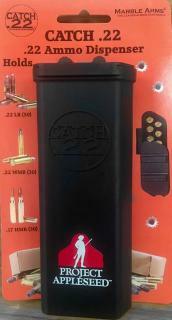 The Catch .22 ammo dispenser holds 50 rounds of .22 ammunition organized in 10 tubes of 5 rounds, protected from dust and dirt. Grooved top allows access to one tube at a time. Comes with belt clip. Great tool for tube loaders, for youth events, for bug-out bags. Appleseed branded.